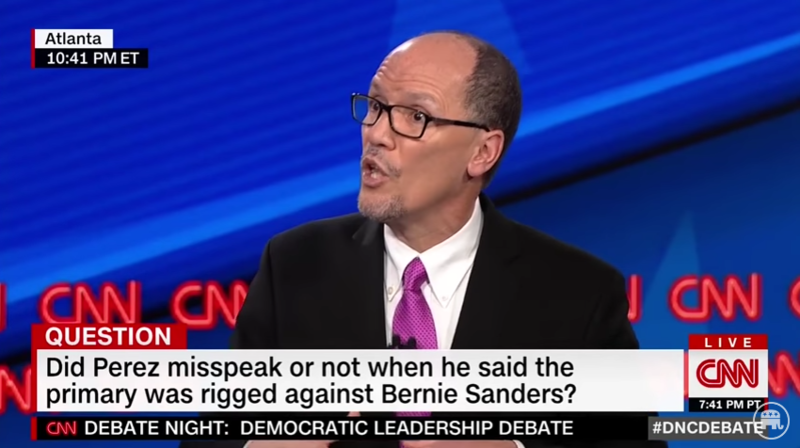 Former Secretary of Labor Tom Perez refused to answer when asked if the 2016 Democratic primary was rigged during Wednesday nights debate for the DNC Chair position. The former Obama administration official dodged the question 3 different times when asked by CNN’s Chris Cuomo. “Well, you know, here are the facts, Hillary Clinton won the Democratic primary. Hillary Clinton also won the popular vote. At the same time, because of the absence of transparency in the Democratic primary, there was a crisis of trust that ensued. And what we need in the chair of the Democratic Party is to make sure that in fact, and in perception, every single day, you are fair and neutral. That’s why when you asked a question before about primaries, you have to let that primary process go.